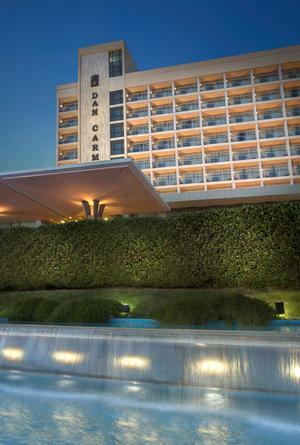 Set high on mount Carmel in the heart of Haifa's entertainment centers, with dramatic views from every outlook, the Dan Carmel offers vacations and business guests much more than the city's best address. Just 50 meters from the magnificent Bahai hanging gardens, described as the "Eight Wonder Of The World". Distinguished by elegant interiors,a welcoming ambiance and gracious service, the hotel invites you to relax in private gardens with breathtaking views of the bay and endless coastline. 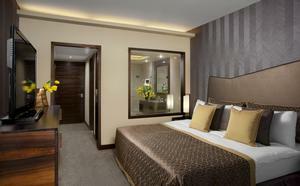 Guests can enjoy a seasonal swimming pool, a children's club and free Wi-fi in all guestrooms and public areas. * please book family plan as follows: FOR 2 ADULTS + UP TO 4 CHILDREN IN 2 ROOMS PLEASE BOOK: 2 ROOMS FOR 1 ADULT + MAXIMUM 2 CHILDREN EACH. (EXAMPLE - FOR 2 ADULTS + 3 CHILDREN: ONE ROOM FOR 1 ADULT + 1 CHILD & ONE ROOM FOR 1 ADULT + 2 CHILDREN) * Guests with a foreign nationality with a B2 or B3 visitors permit stamped in their foreign passport,are exempt from V.A.T. All other guests - Israelis - are charged 17% V.A.T according to prevailing Israeli law (excluding Eilat). Israeli citizens are aware of this law. 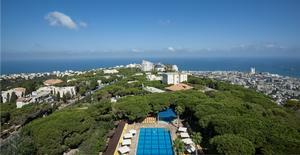 All rooms overlooking the Carmel Hills and Sea or beautiful and romantic Haifa bay. Dial up via an extra telephone line. Non-Smoking Rooms. Situated On the slope of mount Carmel Overlooking Haifa Bay. Just 50 meters from the magnificent Bahai hanging gardens, described as the "Eight Wonder Of The World". "Location is excellent, rooms are large and comfortable, food is very good, but the hotel needs ..."